I thought it was time for another look at some of the amazing factual titles that have been coming out in the last twelve months. It is fascinating that we are having such a resurgence in information book publishing and yet at the same time we still have the doom-mongers who say that we only need the internet for our information needs.It is fair to say that the number of non-fiction books found in schools seems to be on the decline but that may be a symptom of lowering budgets rather than a desire to be online all the time. 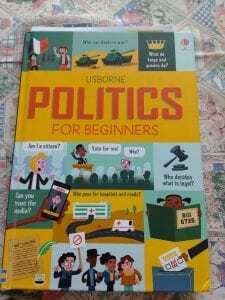 ” Usborne Politics for beginners” by Alex Frith, Rosie Hore, Louie Stowell and Kellan Stover. It is not often that a book about politics, written for children, causes such a stir but this title has done exactly that. Whilst aimed at KS2 and above this is actually very suitable for adults who have not shown an interest in politics before. It is divided into six main chapters, covering everything from kinds of governments to some of the major ‘questions’ that people as, such as “what is terrorism?”It is a well laid out book and has been very well researched. It has also used a range of experts, from BBC reporters to MPs. I particularly like the section on how to hold a debate because it makes you think about different aspects of the discussion. It has a good index and glossary and is really recommended, both for school and for the home. 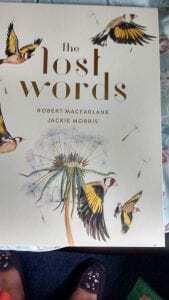 “The Lost Words” by Robert MacFarlane and Jackie Morris is a totally stunning work of art, both in the poetry and in the illustrations. The premise it simple; it is an alphabetical list of terms associated with nature, that seem to be disappearing from everyday knowledge and usage. However the reality goes far beyond this, because each definition or description is a poem in its own right and the first letter of each line adds up to create the name of the subject matter. Jackie Morris’s illustrations are almost beyond description; they are sumptuous, lyrical, magical evocations of the world around us. This is one of those books that totally transcends the way we label books. It is something that can be read and pored over with a small child, but it also works as a wonderfully absorbing read for adults. It is possibly at the top of my non-fiction list for the last year. “Where’s Jane” by Rebecca Smith and Katy Dockrill is a look at the novels of Jane Austen. It covers six of her most famous works and gives a very concise description of the stories. Each book is given a double page spread with details of the plot as well as a small vignette of the characters. 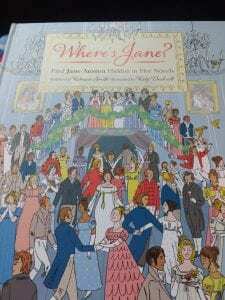 There is also a double page of just illustration which shows scenes from the book and which has an element of “Where’s Wally as the reader has to find the character of Jane, as well as her Pug dog. there is a great deal of complexity in the illustrations, all of which show everyday activities of the period and give us a real sense of the time. What is particularly helpful is the slight change in the colour palette for each of the books, this creates a natural division between the sections and brings a different atmosphere to each story. As we commemorated the bicentenary of her death in 2017 this book seems particularly well times. It will be extremely useful, not only as an introduction to the books, but also a look at the social and cultural elements of life in the early 19th century. Definitely one for the KS2 classroom. 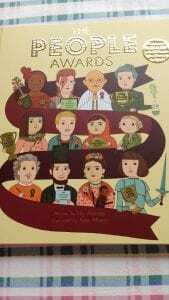 “The People Awards” by Lily Murray and Ana Albero is a look at 50 people through history who have had an impact on the lives of the world around them and changed the way that we think. Some of these people are household names but many of them are not; however they have all been chosen to represent specific quality. the book is aimed at younger readers, from about 7 years upwards and it is heavily illustrated with bright and cheerful pictures. this introduction really whets the appetite and will hopefully lead young people to find out about the award winners in more detail. 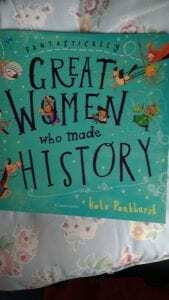 “Great Women who made History” by Kate Pankhurst is one of the many books about strong women that have been produced in order to commemorate the 100th anniversary of Women’s suffrage. This one is aimed at a relatively young audience, the lower end of KS2 or even good readers who are slightly younger. The range of women cover the last four thousand years of our history from Ancient Egypt to the Russian Cosmonauts; whilst most of them are well known there are one or two who do not usually appear in such books and it is great to see this variation. It is a brightly illustrated book with plenty of information, but in bite-sized chunks and I am sure that readers will be encouraged to go ahead and find out more about the amazing women mentioned. 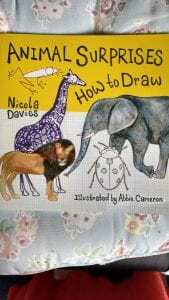 “Animal surprises:how to draw” by Nicola Davies and Abbie Cameron. Nicola Davies is one of the most well known and respected writers of narrative non-fiction for young people, with an emphasis on the natural world. This book is part of a series that she has written in collaboration with a young illustrator called Abbie Cameron. The idea is to show young people how to draw some of the creatures that are found in some of Nicola’s books, starting with “Animal Surprises”; this will be followed by other titles such as “The Word Bird” and “Into the Blue”. Each animal has a short half page description by Nicola but the main emphasis is on the building of the illustrations. It is aimed at the absolute beginner, using circles, ovals and lines to construct frameworks and then filling in the details. I feel as if even I could have a go at creating the animals shown. 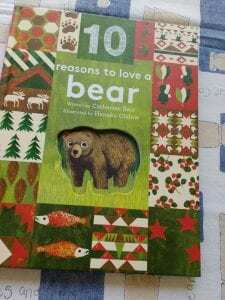 “10 reasons to love a bear” is part of a series aimed at younger readers and which introduces them to some of their favourite creatures in the wild. There are double page spreads and just three or four lines of text on each page, so that it makes for a great book to read on a one to one basis. the facts act as a starting point for more in-depth searching. It is a very child friendly series and further titles include Whales and Elephants. This really is just a taster for some of the many titles that are coming out at the moment. I have already got a small pile of them, ready for the next review and there are several that have really got me excited. What a really brilliant time for children’s publishing and especially for non-fiction titles. This resurgence is something that we can only be grateful for and hope that it continues.